Using ultrasonography to place central lines has been shown to improve patient outcomes when compared to using anatomical landmarks alone (Denys, Iwashima, Karakitsos). 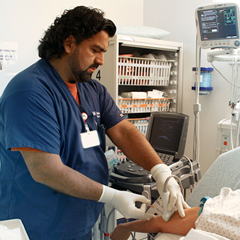 SonoSim offers a comprehensive library of modules designed to help physicians improve and refine their ultrasound-guided venous cannulation technique and specifically improve their peripheral line, internal jugular line, femoral line, and subclavian line proficiencies. 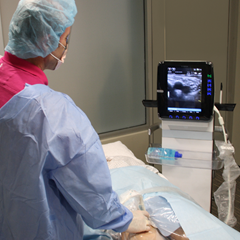 The SonoSim® Vascular Access Package offers over 30 hours of content for practitioners looking to learn how to perform ultrasound-guided procedures. 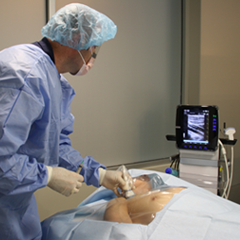 The package is organized into 5 SonoSim® Modules, including over 50 SonoSimulator® hands-on training cases across a variety of essential medical topics related to performing ultrasound-guided venous cannulations. 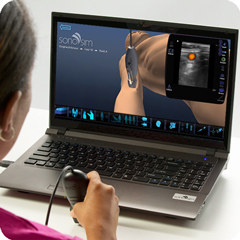 Each SonoSim® Module consists of didactic lessons, knowledge assessment, and SonoSimulator® hands-on training cases. Denys BG, Uretsky BF, Reddy PS. 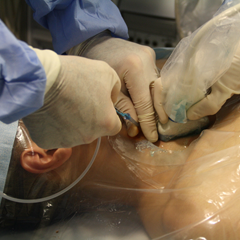 Ultrasound-assisted cannulation of the internal jugular vein. A prospective comparison to the external landmark-guided technique. Circulation. 1993 May;87(5):1557-1562. Iwashima S, Ishikawa T, Ohzeki T. Ultrasound-guided versus landmark-guided femoral vein access in pediatric cardiac catheterization. Pediatr Cardiol. 2008 Mar;29(2):339-342. Karakitsos D, Labropoulos N, De Groot E, et al. Real-time ultrasound-guided catheterisation of the internal jugular vein: a prospective comparison with the landmark technique in critical care patients. Crit Care. 2006 Nov;10(6):R162. How Far Back from the Probe does the Needle Enter the Skin?